U.S. District Court Judge Lucy Koh on Tuesday entered an order granting in part Apple's summary judgment for the upcoming Apple v. Samsung trial, finding Samsung to infringe on one patent, while invalidating another belonging to the Korean company. 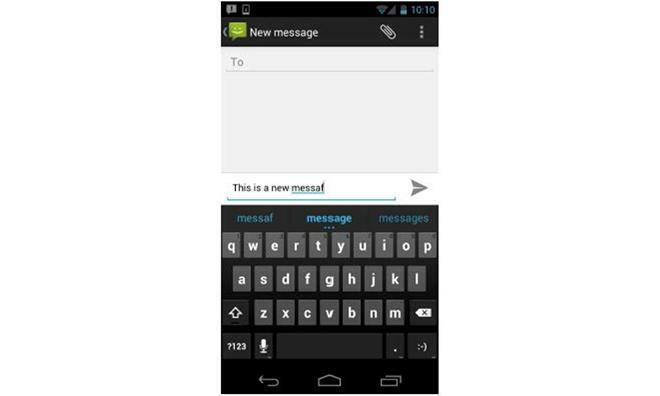 Screenshot of Galaxy Nexus UI used to argue infringement of Apple's autocorrect patent. In her summary judgment, Judge Koh ruled Samsung devices in question infringe on Apple's U.S. Patent No. 8,074,172 for autocorrect functionality in iOS, while a Samsung patent covering multimedia synchronization was found invalid. As first noted by FOSS Patents' Florian Mueller, the orders relate to two Apple motions for summary judgment in an upcoming case slated to begin in March. Judge Koh presided over the landmark Apple v. Samsung jury trial —currently in post-trial proceedings —and will oversee the two companies' second California patent case in spring. The jurist previously laid down ground rules for both parties, limiting each side's infringement contentions to 15 accused devices and ten asserted claims from five patents. With Tuesday's partial granting of Apple motion for a summary judgment, Judge Koh also invalidated one of Samsung's patents-in-suit, bringing the count down to four for the Korean tech giant. Samsung was asserting three claims from U.S. Patent No. 7,577,757, which covers synchronization of multimedia content across multiple devices. The Galaxy device maker acquired the property in 2011, well into the firm's patent battle with Apple. Mueller speculates Samsung obtained the patent primarily for use as a weapon against Apple in future litigation. In any case, Judge Koh found the property invalid as Apple successfully argued prior art to each Samsung claim. Mueller points out that Judge Koh's order is in line with pre-trial proceedings of the first Apple v. Samsung trial that took place in the summer of 2012. At the time, Samsung was denied each of its summary judgment requests in the case, while Apple was cleared of infringing one of three Samsung patents. This time around, Apple may be in an even better position as it already has one patent deemed infringed, meaning counsel only needs to defend the property's validity during trial. It also has four other patents in play, though Judge Koh denied summary judgments for two of these in her Tuesday order. Finally, Samsung found no joy in its own motion for summary judgment as the jurist denied it in full. The second Northern California Apple v. Samsung patent trial is scheduled to start on March 31.